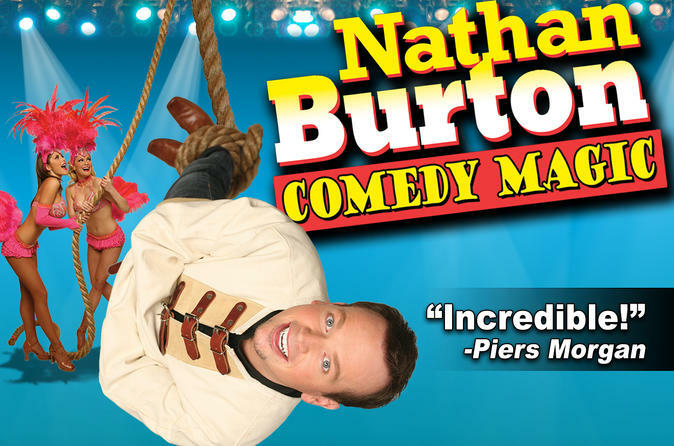 Nathan Burton Magic Show is family entertainment at its best! You’ve seen Nathan on "America's Got Talent. The master magician not only performs unbelievable large-scale illusions at rapid-fire pace, he guides the audience through interactive magic that happens in their hands! All ages. 4pm daily (dark Monday) at Saxe Theater inside Miracle Mile Shops - Planet Hollywood Resort & Casino. Inside the Saxe Theater at Las Vegas’ Planet Hollywood Resort and Casino, one of the city’s most popular magicians puts on a hilarious and high-energy production your whole family will enjoy. If you saw Nathan Burton on America’s Got Talent, where he first became nationally recognized, then you know you’re in for an amazing magical experience. This popular YouTube magician made the move to Las Vegas and now has a show that’s been voted the #1 afternoon magic show in the city, full of outrageous illusions and accompanying humor. Don’t miss out! Special Offer - Book and save 82% compared to the local supplier's price! - Book Now!